"Chess is Life" - said Bobby Fischer. Similarly games such as Backgammon Draughts, Go, Cribbage, etc. feed the mind and nourish the soul. As for chess, Howard Staunton was the man who helped establish the standard of the design that came to be known as 'Staunton', where the Queen has a coronet, the King a cross, etc. 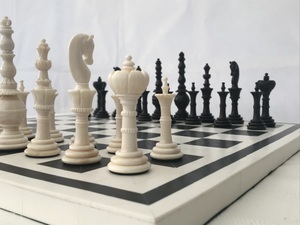 Jaques have always been closely associated with Staunton, and most chess sets today are in the Jaques Staunton style - certainly all the ones played in chess tournaments. There's nothing official about Staunton - it's just a style - the one that has come to be known as the default style in chess. 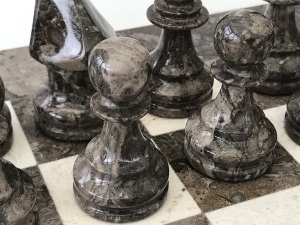 ChessBaron has mostly staunton sets, but also has themed chess sets including the popular Isle of Lewis, along with such sets as Sherlock Holmes, Battle of Waterloo, etc. Dear Baron, I have just received my set today, and I thought a quick email to say thank you was in order. 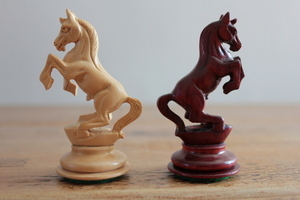 The Marina and Boticini chess set is perfect! A beautiful piece, that although, is going to be used to play, looks fabulous on display too. Absolutely worth the money! Many thanks and kind regards, Phi**. Hello, I recently ordered the Bud Rosewood Staunton luxury set with the matching board. The set arrived within 5 business days and is just beautiful. The individual differences on the knights make for a unique set and the rich wood makes a beautiful centrepiece in my living room. It will be a treasured possession for many years to come – if only my chess skills matched the beauty of this set! 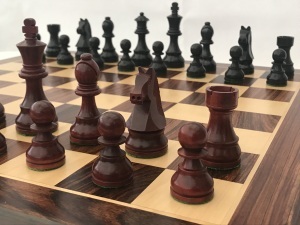 Baron just to let you know the Battle of Waterloo chess set has arrived safe and sound and the 2" square rosewood board (B2009) that was recommended on your website is absolutely brilliant. I have purchased these for my Father as a present and I know he will be absolutely thrilled with them. Your email communications, dispatch information and postal tracking numbers are second to none, a very efficient and pleasurable Internet purchase, I would recommend your company to anyone, thanks again. 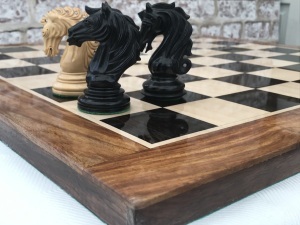 Hi Chess Baron, I recently ordered a set and board for my dad's Christmas present as he is an keen chess player. 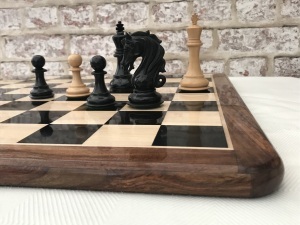 I can't say I am too surprised by the superb quality of both the pieces and the board as your website has excellent photographs and discriptions, but the overall level in the quality of transaction was a surprise! From the ease and assurance of the online transaction, to the swift confirmation emails complete with tracking numbers through to the speed of delivery - from order to delivery of 2 days (at this Christmas time of year as well!) - I have been very impressed. I do a fair bit of internet shopping and this purchase has been easily one of the best. Excellent products, excellent service and a very happy customer. Thanks. Hi, Just wanted to let you know that the Battle of Culloden arrived safely today - and it is FABULOUS! I am so impressed with your service (it is outstanding) and the order-to receipt-of goods time is the best I've ever experienced. Thank you so much! I know my son is going to love his birthday present and I shall be delighted to recommend you to all my friends and family. Hi. Would just say im overly pleased with chessbaron. Great communication, shipping time, service, packaging and brilliant goods! I am usually reluctant to join bandwagons, but I will happily make an exception for Chessbaron and join the chorus of voices singing the praises of this fantastic company. The quality of the set I purchased some years ago was excellent and I really ought to have given some positive feedback at that time, especially when one of the pieces with a tiny flaw was immediately replaced without question. However, I can now remedy that failing because you have once again provided me with superb service. I am extremely grateful that you found a replacement king for another set that has a lot of sentimental value to me. I know how difficult it is to match a piece in that way - I had spent a lot of time scouring the internet in vain. Needless to say, I will happily recommend Chessbaron to my friends and am happy if you share that recommendation with a wider audience. 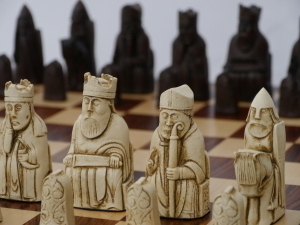 I am writing to express my thanks for the King Cross Staunton Chess Set that arrived today. My compliments:- this is truly a beautiful work of art, and also my compliments on the standard of the packaging - well done indeed! I'm looking forward to many years of playing (oops-learning! We never stop learning this game do we!) 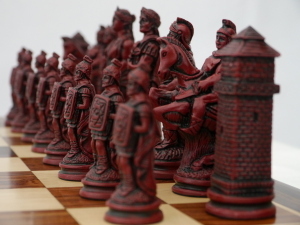 with this wonderful chess set. Thanks for a really excellent service. The set is beautiful and arrived very quickly. Thank you. Thank you very much for your quick response. We look forward to receiving the board cover. We have been really impressed with the level of service that you have provided and the quality of your products. We have now got a super product from you - the Canterbury pieces and rosewood board. It looks so fantastic. It was an engagement present from me to my fiance as he has always wanted a set of chess pieces and we met in Canterbury! We are both delighted. It is certainly something to treasure as well as enjoy looking at and using. Thank you again.